In 1950 Ernest Hemingway wrote to a friend, “If you are lucky enough to have lived in Paris as a young man, then wherever you go for the rest of your life, it stays with you, for Paris is a moveable feast.” Hemingway started to write what would eventually become the book with that title in the autumn of 1957 and finished the manuscript, as the preface indicates in 1960, at his estate, the Finca Vigía in San Francisco de Paula, Havana, Cuba. The book was published posthumously in 1964 and to this day it is one of Hemingway’s most beloved works by scholars and aficionados alike. A memoir of Paris in the 1920s, where Hemingway writes about other expatriates and luminaries, such as Gertrude Stein, Zelda and F. Scott Fitzgerald, his first wife Hadley, his infant son Jack (Bumby) and Pauline Pfeiffer, Hadley’s friend, who would eventually become the second Mrs. Hemingway. It was during this time in Paris and visits to the Louvre when Hemingway “was learning something from a painting by Cézanne that made writing simple true sentences far from enough to make the stories have the dimensions that I was trying to put in them” (A Moveable Feast, 13). Hemingway’s brilliant prose evokes the mood, the unquenchable and wild enthusiasm of a group of artists, of whom Gertrude Stein referred to as Une Generation Perdue (The Lost Generation). Ernest Hemingway lived in many different places, but it was in Havana, Cuba, where he lived the longest. He first rented La Finca Vigía with Martha Gellhorn in 1939, purchased it in 1940, and lived there until 1960, when he left the island for the United States en route to Spain, never to return to his Cuban paradise. In the late summer of 1961, Mary Hemingway, the author’s fourth wife and recent widow donated the Finca Vigía to the Cuban people. The house and most of its contents tell a story of a certain writer whose experiences as a young man were to define him and his work for generations to come. Raúl Villarreal, La crisis de la abundancia, 2012, Oil on linen, 48 x 60 ins. During his two decades in Havana Cuba, Hemingway’s beloved Paris was present at the Finca. On a wall of his workroom, between two large windows hung El guitarrista (The Guitar Player), a large painting by Juan Grís. It was one of Hemingway’s favorite paintings, which evoked much nostalgia from those Paris years. Hemingway would often contemplate the painting between writing and at times laugh and talk to himself. There were other works of art, which reminded Hemingway of Paris, such as The Farm by Joan Miró and The Jungle by André Masson. Besides the art there were also books by his favorite French authors such as Honoré de Balzac, Victor Hugo and others. There were also visitors from all over the world who came to spend time with the man they fondly called Papa. Charles Ritz, the owner of the Ritz Hotel in Paris, visited Hemingway at the Finca Vigía in 1954 and two years later in Paris, Charles Ritz mentioned to Hemingway that there was a trunk with some of his papers stored in the hotel, which Hemingway brought back to Cuba in 1957. Those “Paris Stories” eventually became A Moveable Feast. There was the time when Hemingway was away from Cuba for almost one year. It was 1953-54, Hemingway and his wife Mary went to an African Safari. Hemingway had been contracted to write an article with expenses paid by Look Magazine. During that time a very close friend of Hemingway, Evelio Mustelier, also known in the boxing world as Kid Tunero (aptly nicknamed because he was from Las Tunas), stayed at the Finca as Hemingway’s special guest. Mustelier had had a brilliant boxing career in Cuba and in Europe, however the ultimate pinnacle in the pugilistic profession, a world championship, had eluded him. Kid Tunero, a strong and fast middleweight, had defeated three former world champions but never for a belt. Hemingway saw his friend’s last fight against a much younger, stronger and heavier class opponent in Havana and was saddened by the experience. Hemingway later wrote an article for the Associated Press comparing Evelio Mustelier’s courage to that of Cuba’s Titan de Bronze (The Bronze Titan) El General Antonio Maceo, one of the foremost heroes of the Guerra de Independencia of Cuba against Spain. Evelio Mustelier had most of his boxing career in Europe, eventually marrying in France and raising a family. However, in the mid-1950s, he was back in Cuba after some fights in South America trying to raise funds to get back to France to reunite with his family. Mustelier decided to invest what little money he had in France in the export of good French wine into Cuba. Upon Hemingway’s return to Cuba in 1954, he found out about his proud friend’s financial situation and purchased most of the shipment of French wines from Mustelier. A couple of Hemingway’s wealthy Cuban friends purchased the rest of the shipment and Evelio made enough money to return to his family in France. These anecdotes told by my father, René Villarreal, are the kind of stories found in our book Hemingway’ Cuban Son, which was published by the Kent State University Press in 2009. As the theme for the exhibition “A Moveable Feast” came about, Dr. Ginny Butera and I thought of such Hemingway anecdotes and the Paris connection at the Finca Vigía. Hemingway enjoyed his French wines with certain meals. He was very specific about that, just like his taste for Chinese food at the Finca, as well as in one of his favorite restaurants in Havana’s Chinatown. Ginny Butera had seen my painting The Crisis of Abundance at an exhibition in New York City over a year ago. The piece has its inspiration from another work by Hemingway, “The Old Man and the Sea.” There is a lot of symbolism in the work with the nine King Mackerels (a fish that migrates), hoisted by the two fishermen (one old and one young), who seem to be going in opposite directions. The fishermen are inside a deteriorated and decrepit room surrounded by the ocean waves. The piece symbolizes migration, entrapment, but above all it speaks about perspectives. The perspectives and needs of a young person are different than that of an older person. My father has often told me that his favorite work by Hemingway, The Old Man and the Sea, has meant something different each time he read the book at various stages of his life. “As a young man it meant something different than now when I am in my eighties,” he has said to me, “because our perspectives and priorities change.” For me, The Crisis of Abundance also speaks about having “too much” and having the knowledge or experience of dealing with an overabundance. Are we taking too much from Mother Nature? When is too much really too much? The presence of the ocean represents Yemaya, the sea deity, who crossed the Atlantic Ocean in the prayers, laments, songs, drums and hearts and beliefs of millions of African slaves, who were forcedly uprooted from their homeland and brought over to the Americas. In the African beliefs, Yemaya is the mother of all and without her there is nothing. She punishes those who abuse her good nature. Ernest Hemingway enjoyed the numerous countries in which he lived, traveled, and wrote. He was one of the most recognized and adventurous global citizens of his time. This is evident in his works. He took notice of the local customs, food and drinks that his characters consumed in their time and place. For example in the Old Man and the Sea, the old fisherman enjoys drinking Hatuey beer, having a café in the morning, eating rice and beans for dinner in his shack, and also the raw fish that he eats to maintain his strength as he battles his brother— the big fish in the Gulf Stream. However, no other work by Hemingway compares as such a brilliantly written memoir of a very unique epoch and place as does A Moveable Feast. by Virginia Fabbri Butera, Ph.D.
A Moveable Feast: Art, Food and Migration, is an exhibition currently on view through May 4, 2014, at the Therese A. Maloney Art Gallery at the College of Saint Elizabeth in Morristown, NJ. The show examines ideas about imagery in today’s art that were triggered by the intersecting cultural events I studied while developing an interdisciplinary course, “The Art of Salsa Making: The History of Hispanic Heritage in the Americas,” with my colleagues, food historian Sonia Hartunian-Sowa, Ph.D. and language professor and cultural historian, Christine Guedri Giacalone, Ph.D., with input from the exhibition’s co-curator, Raúl Villarreal, MFA, who was a guest speaker in our course. What became clear during the course was how food and related artistic subject matters have been affected by the mixing of cultures in the Americas during the last six centuries. This was reinforced when Prof. Villarreal showed an image of his painting, The Crisis of Abundance (above), to our class, and explained its cultural references as he does in the above article, “Hemingway and A Moveable Feast.” Subsequently, Prof. Villarreal and I decided to investigate how art today continues to reflect the effect of travel and migration on the imagery of food in art. One result of the 16th century Spanish conquest of the New World was the mixing of tomatoes and chiles (New World) with onions and garlic (Old World) to create “salsa,” now the number one condiment in North America. Here “salsa,” the chopping and mixing of ingredients, as well as the lively music and dance styles that bear its name, stands as the continuing metaphor for the food-related experiences of Americans from all different groups when they eat at home or abroad. The current exhibition reveals markets, restaurants, food, utensils and eating habits that define high and low culture and that signal the history, desires, realities, amusement and horrors that are part of the contemporary eating experience. Throughout the history of art, food, like fashion, reveals a multitude of cultural traditions and implications. Visible in ancient Egyptian tomb paintings, food was meant to be available for the deceased in the afterworld. In ancient Greek and Roman vases and wall murals, depictions of foodstuffs could reveal a painter’s skill as well as document the dining customs of the wealthy. Still-life oil paintings, the rage in late 16th and 17th century Italy and Holland, focused on the realistic depiction of food as well as its metaphoric implications, from the sensuality of bunches of grapes in Michelangelo da Merisi Caravaggio’s c. 1593, Boy with a Basket of Fruit (http://www.telegraph.co.uk/culture/culturepicturegalleries/6818200/Paintings-by-artist-Caravaggio.html?image=1) to a reminder of death suggested by worm holes in the fruit or a dead rabbit on the buffet table as in Fran Synders, Still Life (http://commons.wikimedia.org/wiki/File:Frans_Snyders_-_Still-Life_-_WGA21533.jpg). By the late 19th and early 20th centuries, the inclusion of food in art was no longer considered a subject matter secondary to history painting or portraiture as it had been until that time. Paintings of apples by 19th century French painter Paul Cézanne refer to classical Greek myths, Adam and Eve, female sensuality and fertility while still functioning as everyday subject matter and a vehicle for his dramatic new style of post-Impressionist painting (http://www.ibiblio.org/wm/paint/auth/cezanne/sl/plaster-cupid/). 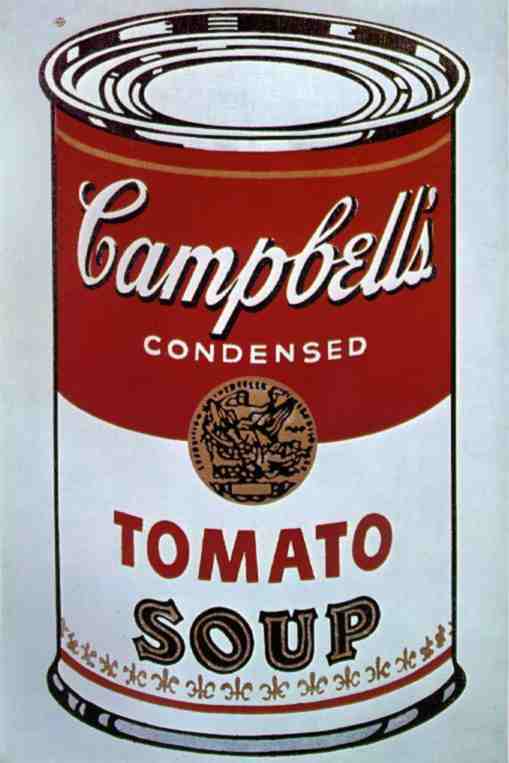 [iv] American Pop Art pieces of the 1960s: Andy Warhol’s silkscreen images of soup cans (http://utenti.romascuola.net/bramarte/pop%20art/img/war3.jpg) , Claes Oldenburg’s food sculptures including hot dogs and hamburgers sewn with fabric (http://www.moma.org/explore/inside_out/2013/05/24/dramaturgy-and-gut-inside-claes-oldenburgs-mouse-museum) and Wayne Thiebaud’s lusciously layered oil painted desserts (http://www.youtube.com/watch?v=vI_QJ5D9Qm8) pointed to consumerism, street culture and the growing affluence and self-indulgence of Americans where everyday life literally and figuratively became art. A Moveable Feast: Art, Food and Migration includes paintings, sculptures, drawings, photographs, mixed media collages, videos and installation works where food and its rituals have an even greater multiplicity of meanings and purposes in our contemporary, globally-aware society than in prior times. When people move or travel, they often “take” their cuisine with them, sometimes dreaming of it as Roberto Márquez implies in his work, El Mapa de México. Humans naturally adopt flavors, sauces, ingredients, spices and beverages from a new locale or entice the natives to enjoy their transferred cuisine as Bette Blank illustrates in a Madison, NJ, restaurant scene, Sushi Palace (Fig. 3). The exhibition, named after a book by Ernest Hemingway (and visualized by José Pardo’s painting of the same name, Une Fête Mobile) recognizes the allure of other cultures’ food, drink, and new experiences, ones that Hemingway had in France, Spain, Cuba and other places which also found their way into his writing. This internationalism is also reflected in the sophisticated, multi-layered, multi-cultural canvas, Tapas, by José Rodeiro (Fig. 4). Laura L. Cuevas references the expulsion from paradise as the ultimate entwining of eating, the Divine and forced “migration,” in her collage, Each day had no limits. From birth until death, human beings are preoccupied with sustenance made visible in Formula by Bob Richardson (Fig. 5) and Carrie’s Recipe or Dad Feeding Mom by Judith Margolis. Fresh food markets, our own version of “paradise,” exist around the world in a variety of settings, in front of contemporary architectural structures painted by Kathleen Migliore-Newton (Fig. 6), on a barque in Kashmir, India, by photographer Jay Seldin or in front of a train stopped in Myanmar photographed by Sue Zwick. Shopping lists are made (Jacquelyn Stryker), recipes collected (Marilyn Walter), and feasts with family and friends are celebrated by Aliza Augustine (fig. 7), Barbara McElheny (fig. 8) and Zwick. Villarreal and Davide Luciano in his photograph, Tossed (Fig. 9) note with irony the problem of abundance and waste even as many in the world have little or nothing to eat. The show represents a contemporary slice of how artists have blended food and drink into their art works which bear little resemblance to centuries-old still life paintings. Instead, in our sampling, food signals how “invasions” and “conquests” are no longer necessarily waged on the battlefield, but rather in the farmers’ markets, fast food shops from all countries and high-end dining establishments where we can travel around the world without even leaving our neighborhood. Virginia Fabbri Butera, Ph.D., is the Director/Curator of the Therese A. Maloney Art Gallery, a Professor of Art History and the Chairperson of the Art and Music Programs at the College of Saint Elizabeth in Morristown, NJ. She has been a curator for over thirty years, organizing exhibitions for museums and galleries around the country including The Contemporary Arts Center (Cincinnati), National Gallery of Art, Philadelphia Museum of Art and the Yale University Art Gallery. The foregoing article, copyright by Virginia Fabbri Butera, Ph.D. No part of this article may be reproduced without permission of the author. [i] See the general, beautifully illustrated, introductory essay in, Jane Milton, Jenni Fleetwood and Marina Filippelli, The Complete Mexican, South American & Caribbean Cookbook, New York: Barnes & Noble, 2007, 6 – 81. [iii] Byron Ellsworth Hamann, “The Mirrors of Las Meninas: Cochineal, Silver, and Clay,” Art Bulletin XCII, 1-2 (2010): 6 – 35. We decided to write our Twice is Nice Column as a Food for Thought, instead of as our usual blog. The recipe we made, Corzetti con Maggiorana e Pinoli, came from The Geometry of Pasta by Jacob Kenedy and Caz Hildebrand. The dish is a simple combination of “corzetti”, which resemble embossed coins, with butter, pine nuts, and marjoram leaves. According to the book, this Ligurian pasta shape dates back to the 14th Century, and was shaped with hand-carved wood stamps, usually of the family coat of arms. I must be honest and admit that I outsourced this recipe to my grandmother, as I had too many things on my plate (pun intended), and needed some help last week. We had some whole wheat penne in our cupboard, and so that is what we used instead of the corzetti. I later learned that Emma put me to shame (see below). My grandmother followed the recipe exactly, and the results were delicious. Marjoram is a particularly strong herb. It is not something subtle that merely enhances a dish, but rather dominates whatever it seasons. Though it can be combined with thyme, oregano, and a few other Mediterranean herbs, I usually see marjoram on its own. The pinenuts were a good match for the herb, and though the sauce was light and simple, the flavors were strong and forthright. Emma’s Notes (pictured): We made a night out of this recipe and made the pasta at home. My boyfriend came over iwth some wood-carving tools and carved a stamp out of a piece of firewood so that I could emboss the pasta discs. It worked amazingly well, though we only embossed the pasta on one side and not two. The pasta turned out a bit hearty, but it was a hit nonetheless. . . we ate it with Caesar Salad and beets from our friend’s garden. Emma and Sophia met in their first year Arabic class at Georgetown University in 2001. Being the only two people in the class without a Middle Eastern background, they bonded over their inexplicable love of Arab culture. In the years following, they ventured to desert oases, went bowling on the Nile, and drank avocado juice with honey and cream by the Mediterranean Sea. After graduation, Emma turned her focus to film, and was off to Greece to direct her first movie. Meanwhile, Sophia decided to go to New York City to attend culinary school and study nutrition. In the fall of 2006, they found themselves together again, and were inspired to combine their passions. The result of this collaboration is Kitchen Caravan. Taste more at http://www.kitchencaravan.com. Your gardens and local farmer’s markets are likely in full bloom as we enjoy the last weeks of summer; look around at some of the bounty: cucumbers, melons, apricots, grapes, peas, onions, okra… these crops have been growing in Iraq for thousands of years. Maybe when you take your next bite you will think of the farmers in Iraq who are enjoying similar tastes and textures so far away. • Editing begins: Since returning from our June filming trip, we have been editing and organizing footage, photographs and audio files. We hope to share some of the material with you soon… To do this we need to build our website’s library: You can help! • Seeds of Kurdistan: We are happy to announce the launching of our latest initiative. This website celebrates the agricultural traditions of Iraqi Kurdistan and will also provide training materials for the region’s farmers. • Facebook- you can now keep track of the latest news of agricultural activities in Iraq as well as what’s happening at The Iraqi Seed Project by following us on facebook. • The Tiziano Project just wrapped up a summer workshop in Erbil, training local journalists in new media skills. Watch the video Zana Mamundy, one of their students, produced about grain growers in Mahkmour. • Wheat Fleet: August 19-21st we are floating a portion of the Willamette River to promote local grain growing in Oregon. Chop the onions and sauté them in oil with a heavy bottomed pot, add the bulgur and seasonings, pour over the broth and bring to a boil. Reduce heat to low, cover and simmer until broth is nearly absorbed. Turn off heat and allow to steam for 5 minutes. This Fall The Iraqi Seed Project is going on tour, collecting messages for Iraqi farmers and offering a sneak peak of our film; contact us about scheduling a farm visit, rough cut screening or fundraising event at a community center or school in your area. Check the website for upcoming dates in San Francisco, Philadelphia and Washington DC. As you know, we are in the process of editing and building The Iraqi Seed Project‘s library on our website. We are currently operating with zero funding. Please consider making a tax-deductible donation through Arts Engine, our fiscal sponsor, so that we may continue our work! And of course… we are still collecting images, articles, essays, videos and links for the library— remember you don’t have to be an expert to participate. Be part of our knowledge exchange and share what you know about Iraq, sustainable agriculture, seed saving, biodiversity, or home gardening. Website is up and running for The Iraqi Seed Project — Visit www.iraqiseedproject.com to learn more about what Emma & friends are up to and ways you can get involved. • Ready to go: The team left the first week of June for a filming trip to Iraq and Iraqi Kurdistan. Internet reports will be a bit spotty, but whenever possible, they will post notes and photos on the Field Journal section of the website — so check there for updates. We will be spending our time in Northern Iraq with the Kurdish Ministry of Agriculture, on small farms in the area, and visiting some USDA project sites around Baghdad. Muddle 2 sprigs of the mint, the sugar, and rose syrup or rose water in a martini shaker. Make sure you muddle well to get the essence of the mint extracted. Add in a good amount of ice. Pour over the bourbon and add 2 more sprigs of mint (unbruised) and the lime juice. Shake it up really well and pour into a glass filled with ice and top with the remaining 2 sprigs of mint and a colorful edible flower. This is a very healthy vegetarian dish that is high in fiber and full of Mediterranean flavor. Freekeh is wheat that has been harvested while still very young, and thus is very high in protein, vitamins, and minerals. It has a slightly smoky flavor due to the way the wheat is processed after harvest, so it pairs well with mellow flavors, such as beans and chicken. This recipe calls for cooking the beans from scratch, but feel free to use canned garbanzos for a faster version. The “Short” sauce is a light pesto that adds a zing of herbs and lemon to sharpen the taste of the dish at the end. Drain the garbanzos of their soaking liquid. Place in a medium sized pot and cover with about 3 cups fresh water. Add the rest of the ingredients (you can place them in a bouquet garni bag if you want) and bring the water up to a boil. Simmer until the garbanzos are cooked through. Drain, remove the aromatics, and set aside. Heat up the olive oil in a medium sized pot. Sweat the onion, carrot, fennel, and garlic until the onion and fennel appear translucent. Add the spices and a pinch of salt, and stir for another minute or two. Drain the freekeh of its soaking liquid and add it to the pot. Stir everything together so that the freekeh is well integrated, and cook for about 2 minutes, stirring gently. Pour over the broth and bring to a simmer. Cover the pot and let cook for 30 minutes. Add the garbanzos and continue to cook for another 5-10 minutes, or until the liquid has been absorbed and the wheat is cooked through. Keep in mind that these are wheat berries, so they will have a slightly chewy texture and will not be completely soft. Make the short sauce by blending all of the ingredients together until coarsely chopped, you do not want a smooth puree. Spoon a bit of the sauce into the pot and stir to combine. Serve while warm. Kitchen Caravan was started by Sophia Brittan and Emma Piper-Burket in January of 2007 to provide an online resource for healthy eating and cultural education with quality content and a valuable learning experience. Check it out. Archives explore foods from around the world.